Bar Dell'Artista Accommodation v Řím, Itálie: Zarezervujte nyní! 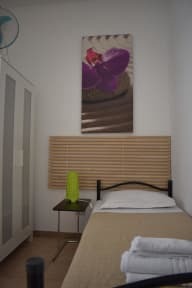 Established in 1990, Bar dell'Artista Accommodation has come to be one of the most popular accommodations in Rome and a well-known place to stay for young travelers. Since its opening it has been recommended in all the main guide books. 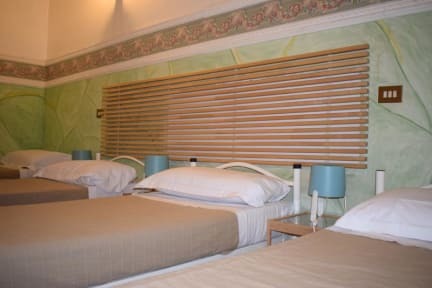 Bar Dell'Artista Accommodation is a calm, clean, budget-friendly place to crash in the heart of Rome. It is located on a 19th-century townhouse close to the Santa Maria Maggiore Basilica and to Via Cavour, one of Rome’s main roads. Despite being a small property, with no common room and no kitchen, our guests appreciate the cozy, homey atmosphere. Several transport options, such as metro, buses, trams, taxi stands, and tour buses, are at your fingertips. Bar Dell'Artista Accommodation is easily accessible from Termini central train station, just a few minutes' walk from the structure. Termini hosts bus and train transport to and from Rome's airports. Our welcoming atmosphere, supported by energetic international staff, makes us a young travelers’ heaven.